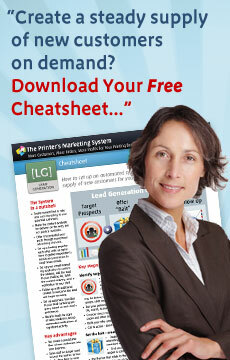 The Printer's Marketing System - Lead Generation. Attract qualified print buyers, capture their details and automate your follow up. Lead Generation For Printers – lets you pull in a steady stream of qualified print buyers who are predisposed to do business with you. Ready To Use Lead Magnets You don't have to write or design anything – it's all done for you. You can choose from an expanding library of reports and educational resources. Prospecting Mailers Ready to use direct mail, banners, and ads – use a variety of economical approaches to reach prospects with your Lead Magnet offer. Landing Pages Each Lead Magnet Campaign has a corresponding mobile optimized landing page, reinforcing the offer and focused on one purpose – maximum lead conversion. Lead Capture Prospects enter their details and give permission for email marketing – their data is automatically stored in the [EM] Email Marketing Application. Automated Follow Up Worry free, reliable, consistent, fully personalized follow up is handled by the [EM] Email Marketing Application. Autoresponder Sequences A sequence of automated email messages welcomes each new lead and provides additional content for each Lead Magnet Campaign. New Lead Notifications When a propect opts in or a lead is engaged and showing signals of readiness, the data is forwarded to you for personal follow up by your sales team. Social Media Integration Your Lead Generation Campaigns are integrated into your social media properties to extend your reach and encourage viral growth. The [LG] Lead Generation Module is available as a standalone service. Please call us at 888-896-7216 for pricing and to find out how the module can integrate into your existing marketing systems. The [LG] Lead Generation Module is also available as a bundled component of the [TPMS] Silver Plan.